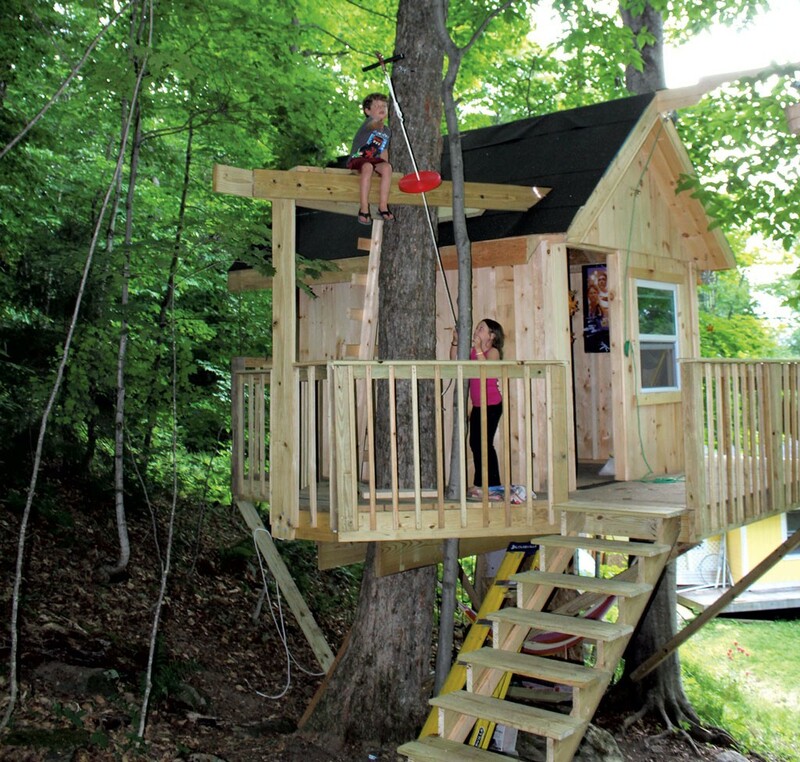 A Backyard Tree House With Zip Line and Hammock | Habitat | Kids VT - small people, big ideas! Jason Mikula was obsessed. 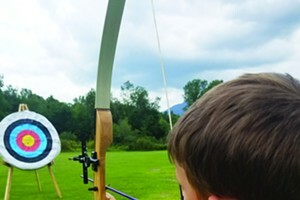 For one month in the summer of 2014, the father of two could think of little else besides finishing the tree house in his Killington backyard. When his wife, Polly, asked him what he wanted to do after work each night that July, he'd reply incredulously, "What do you mean? I'm working on the tree house." He had good reason to hustle. He was building the structure for his kids, Emery, 8, and Sam, 6, who live with their mother in Denver, Co. He visits them regularly, but at the end of that month, they were coming to stay with him and Polly for the first time. Jason knows carpentry basics, but he'd never built a tree house. He and Polly scrolled through Pinterest for inspiration, and their final plan included a zip line and a hammock. They ordered a bunch of pressure-treated wood and got to work. There were mishaps: They initially selected three trees to build the house in, only to discover, when one collapsed just days before they began construction, that all of them were dead. Jason learned the hard way that it's foolish to attempt to hang a zip line by yourself (especially late at night, after a tiff with your wife, when balancing on a wobbly ladder in the dark). He also worried about the project's structural integrity. "I had nightmares that Sam was going to be in the hammock and this whole thing was going to fall down on him," Jason admits. "That's why we did bring in a professional just to look at it and tell us it wasn't going to fall over." When the Mikulas pulled into their driveway on the first night of Emery and Sam's visit, "they jumped out of the car and ran up into [the tree house]," recalls Jason. "They were blasting on the zip line until 10 at night." The tree house includes a climbing wall, zip line, hammock and bucket on a pulley for hoisting treasures up and over the balcony. Jason estimates he spent a total of 80 hours and $2,500 on the structure — worth every penny, he and Polly agree. The project was a family effort. While Jason and Polly flew to Denver to pick up the kids, Polly's sister and brother-in-law worked on finishing touches. Jason's parents installed a whimsical bridge and decorated the inside of the tree house with Star Wars posters, a toadstool-shaped table and chairs, and light-up drinking glasses. Next up: Build bunk beds inside so the kids can spend the night, and install a fire pole through a trapdoor that leads down to the hammock.